The British asparagus season is short but you can of course buy it in if you don’t yet have it in the garden. Quick, simple, yet a dish fit for kings as a sophisticated looking starter or with some special bread for lunch. Serves four. Make up the dressing by mixing the rind and juice of the lemon with the garlic, parsley and olive oil. Season with salt and freshly ground pepper. Wrap three asparagus spears tightly in one slice of Pancetta, winding it along the length to make sure the whole asparagus is well covered in the Pancetta, right to the tip. Do the same for the rest of the asparagus. Now heat a large, heavy non-stick frying pan with a tablespoon of olive oil and place the Pancetta wrapped asparagus in the pan to cook. Do it in batches if your pan isn’t large enough. Cook until the Pancetta is really crispy, turning as you go. Take four plates and arrange a bed of salad leaves on each. Drizzle with the lemon and garlic dressing, turning the leaves gently to coat. 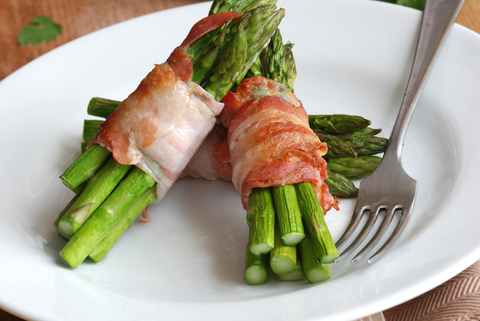 Diagonally slice each Pancetta wrapped asparagus spear in half and lay on the salad beds. Using a potato peeler, shave thin pieces of parmesan over each (optional). Serve with good crusty bread.